A few friends recently told me they’re fans of my blog and look forward to the new posts every week, although they’ve spotted one issue with it: the lack of vegetarian content. Apart from a 6-month period about 8 years ago when I cut out meat as a personal challenge (it was meant to be for a year, but I only lasted 6 months because I relaxed the rules and became pescatarian), I’ve always been a carnivore and so not overly concerned with vegetarian-friendly menus unless I needed to enquire for friends and family. However, my attitude has been slowly shifting since the start of the year as I’ve been introduced to some truly tasty dishes, such as NOPI’s roasted aubergine, black garlic and chilli at Soho Food Feast. One of the dishes on the 6-course tasting menu at Picture Marylebone was equally a revelation: charred cauliflower with sea purslane, peas and shallots (pictured above). Just last weekend, one of the highlights of my meal at The Barbary was the Cauliflower Jaffa Style for its smokiness, richness and vibrancy. Not only were these dishes visually appealing, they also boasted deeply layered flavour profiles and interesting textures. I therefore wanted to dedicate a post to my vegetarian fans, as the days of cheese-laden pasta being the only choice are long gone in London. Dishoom: Indian cuisine is one of the best in terms of catering for vegetarians and vegans with its wide range of lentil, vegetable and fruit curries (banana curries are surprisingly satisfying). 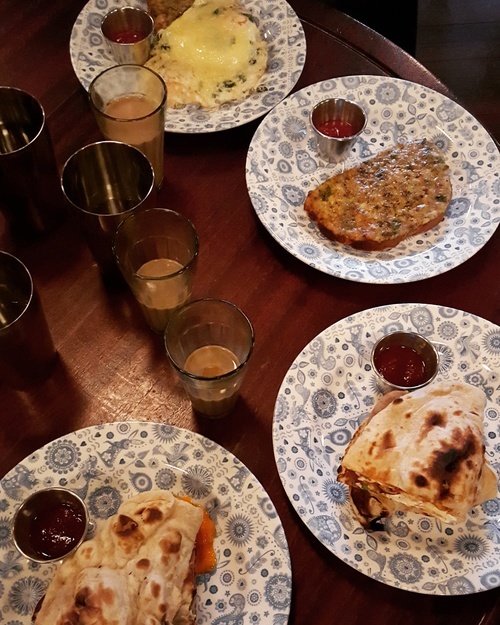 Although not exclusively vegetarian, Dishoom offers plenty of divine dishes from breakfast through to dinner: the infamous naan roll, paneer tikka, chilli cheese toast and their signature black daal, which is simmered for 24 hours for maximum flavour. Tables can only be booked for parties of 6 or more, so long queues are inevitable during peak hours, but the house cleverly keeps frustration and hunger pangs at bay by plying you with steaming hot masala chai while you wait. Use this time to admire the vintage furniture and mismatched crockery, Hindi phrases artfully scribbled on the walls and muted lighting. Read about my first brunch at the Kings Cross branch here (other branches include Soho, Shoreditch and Covent Garden). 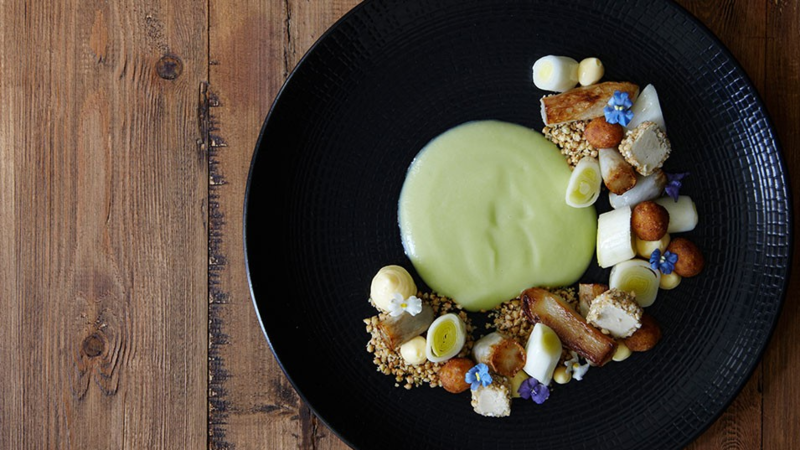 Mildred’s: For one kitchen to please meat-lovers, vegetarians and vegans alike is as unlikely as a sunny summer in England. Thank the heavens, then, for Mildred’s, whose delectable meat-free dishes have customers willingly queuing down the street in various locations (Soho, Camden and Kings Cross). You’ll be spoilt for choice between the sweet potato and green bean curry, lemon and risotto tortellini and beetroot, white bean and dill burger for mains followed by white chocolate mascarpone cheesecake and salted caramel macademia rum truffles. Certain dishes such as the stir fry can be prepared without onions and garlic, so Jains and diners with an aversion to these ingredients can fully enjoy their food, too. Like Dishoom, their no-reservations policy means you’ll need to head there early or be prepared to stand for some time, although you can grab a drink at the bar to quench your thirst. I visited with friends, including a vegan, and everyone left with full, happy bellies. Gauthier Soho: Fine dining and vegan may not be instantly associated by many, but this Michelin-starred establishment has been quietly pushing boundaries since the launch of their 8-course vegan tasting menu to follow their vegetarian offering. Revel in purple cauliflower carpaccio, trompette and girolle mushrooms, soft roasted fennel and Kalmata olive ravioli before being seduced by cherry and dark chocolate and elderflower sorbet with strawberries. Not only is the food a work of art, the restaurant is located in a compact Soho townhouse and filled with elegantly decorated nooks and crannies, so dining here is a unexpectedly pleasurable mix of informal formality. Gauthier was my venue of choice for last year’s birthday celebration with Chef Savla; we ate and drank like royalty then strolled around Soho and Covent Garden in the sun, stopping off at a few wine bars en route. Ottolenghi/NOPI: Yotam Ottolenghi is a magician, capable of coaxing out a world of exciting flavours from vegetables. For a casual ambience, head to one of his several delis/restaurants to tuck into bold and beautiful salads piled high on large platters, freshly baked bread and hot dishes, e.g. pea and feta fritters, moussaka and grilled vegetable bake. Make sure you save space for the likes of dark chocolate mousse with salted caramel and grilled peaches with rosewater yoghurt, fennel and anise. The seasonal theme continues at NOPI, where the interior is slightly sleeker and the pace a little faster. Here, deliciousness is served in the form of courgette and manouri fritters and coriander seed-crusted burrata with slices of blood orange. I overindulged on another birthday, this time a surprise evening planned by Chef Savla. Vanilla Black: A list showcasing vegetarian restaurants would be incomplete without Vanilla Black. This Holborn-based gem is proudly announces on their website that you won’t find a pasta bake or vegetable curry in sight, which instead features cauliflower dumplings, tomato shortbread and fried porridge. With quirky desserts like Kahlua cake with coconut mousse and white chocolate and cep mushroom custard with tarragon cream cheese, you can understand why this place is recommended by Michelin. Vegan and wheat-free menus are also available on request. The team have been proving that vegetable-centric creations are no flash in the pan since 2004 and business show no signs of slowing. I’m planning on going with Mother Savla for my first visit so she can choose from an entire menu as opposed to a couple of token options below the meat and fish sections. Have you been to any of these restaurants? If so, what was your favourite dish? 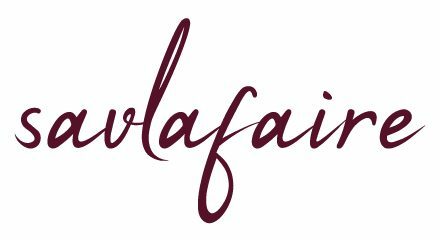 Drop me message with your comments below or via Facebook, Twitter and Instagram (@SavlaFaire), including any vegetarian-friendly venues that you recommend! Wait, wait – fried porridge!? 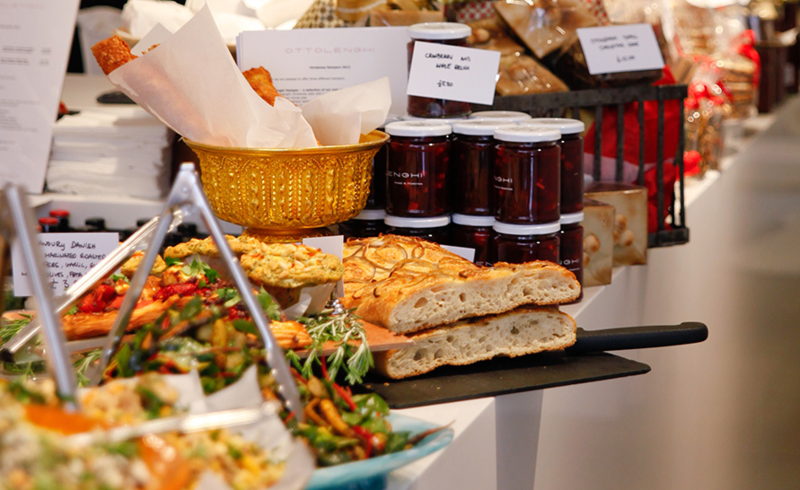 Ottolenghi’s definitely top of my list of veggie-friendly places in London… which reminds me I absolutely MUST take my friend there when she next come to London! Food at The Gate is also not bad if only lacking a bit in originality & despite it not having that much choice in terms of vegetarian dishes, Morito would also be on my list as the few they have are always, always what I’m most impressed with. Ah ha this is a post for me! I definitely need to try Dishoom. I just don’t know why I haven’t been yet. I have however been to Vanilla Black twice! Great list for vegetarians! 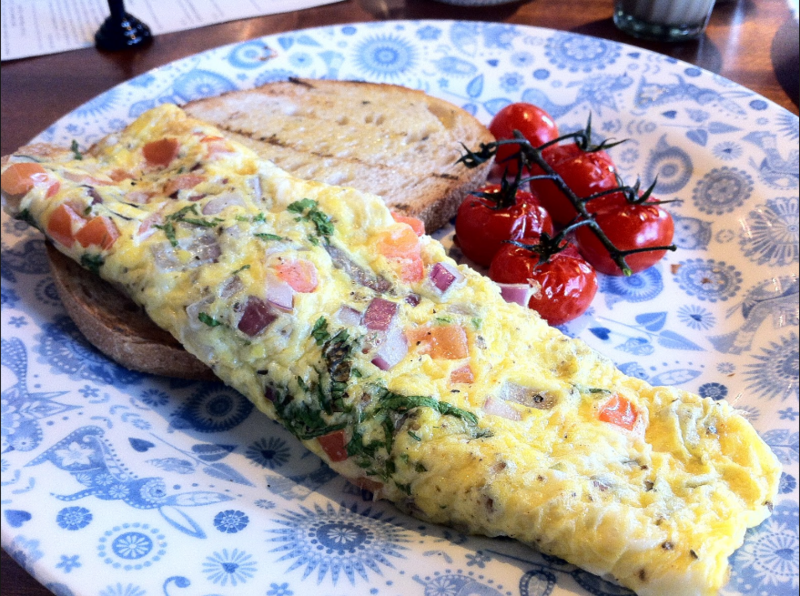 Dishoom is nice, and I think there’s something for everyone there. Love what Vanilla Black do!